Spanek Roaster Kits, Accessories and More! and salads with these intriguing seasoning blends. spaghetti, beans, chili, hamburgers, meat loaf, salads, dips and more! AMERICAN BLEND . . . IT'S OUR SPANEK MAGIC! spark up indoor roasting and outdoor grilling. pork chops - the sky's the limit! Low Sodium. 100% Natural. No Additives. · Two Original - American Blend (6.0 oz jars) (SCC-900/900) $19.00 $18.00 On Sale! GARLIC STUFF . . . THE SPICES OF EUROPE! garlic bread --Spray french bread with olive oil. 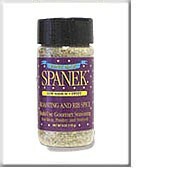 Sprinkle with Spanek "Garlic Stuff" and "Original"
Seasoning Blends. Perfect color -- Perfect flavor! 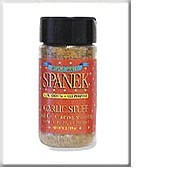 · Two Euro - Garlic Stuff Blend (6.0 oz jars) (SCC-912/912) $19.00 $18.00 On Sale! ROASTING AND RIB SPICE . . . GREAT FOR STIR-FRY! Exotic and mysterious flavors of the Orient. A tiny bit sweet, this gives a new twist to chicken. with our Asian Blend and grill, roast or saute as you choose. · Two Asian - Roasting and Rib Blend (6.0 oz jars) (SCC-913/913) $19.00 $18.00 On Sale! DRY FIRE . . . TANGO TO THE TASTE OF SPAIN! just a hint of hot! Latin Blend is pleasantly warm. 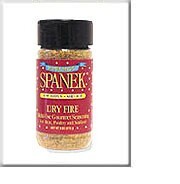 · Two Latin - Dry Fire Blend (6.0 oz jars) (SCC-911/911) $19.00 $18.00 On Sale! Travel the World of Flavors — Try all Four! Enjoy the taste of the world! This collection comes boxed in a mailer with the "Spanek Seasoning Blends" recipe booklet. These 3-oz jars are great gifts or stocking stuffers, perfect for travel, RVs, second homes, convenient for the road... The take it with you collection for your world of taste. Full-size 6-oz jars, perfect for your home use. A staple.